Thursday’s Planning Commission meeting on the General Plan update was intended to discuss neighborhood centers, but the topic of sprawl was clearly looming large over the near-capacity crowd. That was the comment from Deputy Community Development Director Forrest Ebbs who led the staff presentation on the General Plan, informing the commission that there will be a robust debate about the future of Stockton’s city limits in the near future. The comment was prompted by a handful of public comments from the local smart-growth advocacy group Campaign for Common Ground (CCG), which delivered a formal letter to the commission urging them to remove or reclassify areas of the General Plan maps that appear to include thousands of acres north of Eight Mile Road. An earlier version of the Draft General Plan map. Newer versions indicate areas north of Eight Mile may be included in the General Plan. But the draft General Plan maps are just that—drafts. Ebbs was quick to point out that the city staff has only included areas identified in the city’s Sphere of Influence, and up to this point, these areas have been given a “light treatment,” in that they are not at all set in stone. Ebbs noted that the ultimate decision to decide the city’s footprint lies with the commission, and he will take policy direction from them. “At some point, this planning commission will be asked by myself and others to either affirm (whether to include areas north of Eight Mile Road in the General Plan) or make a contrary recommendation,” said Ebbs. The commissioners seemed ready to delve into the topic, with Commissioner Lopez stating that he was “not too thrilled” about any building north of Eight Mile. However, the commissioners all acknowledged that this debate over the city’s boundaries will need to take place at subsequent meetings. That time may be coming very soon. Ebbs indicated that the next Planning Commission study session—which will be held on February 12—might be the beginning of this debate. That meeting may focus on Stockton’s “baseline,” which Ebbs explained refers to the baseline of homes that are already existing (which Ebbs pegged at roughly 100,000) as well as homes that are entitled but have yet to be constructed (around 20,000). The commission will have to decide how many more homes above this baseline might be needed in the future, if any, which may largely dictate how and where the city decides to grow. 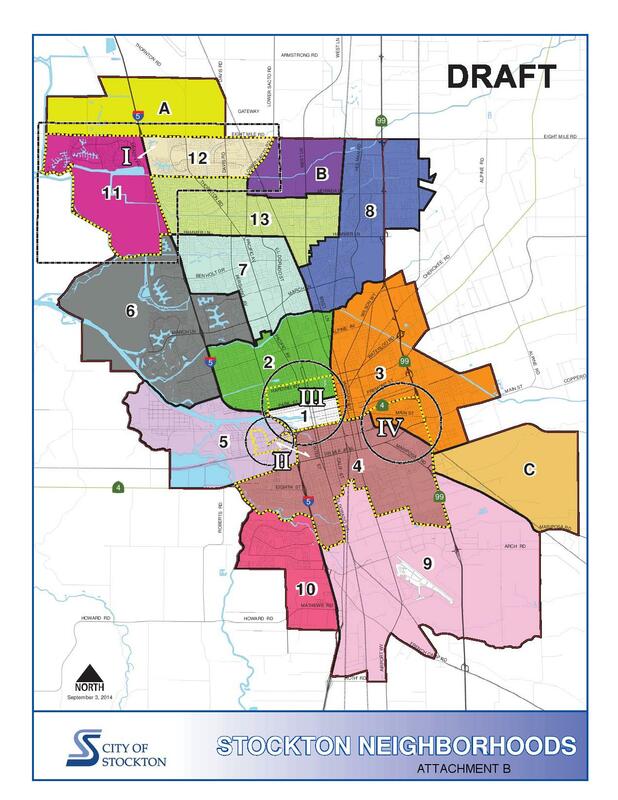 While sprawl was clearly on everyone’s mind, Thursday’s Planning Commission study session was mostly spent discussing staff-suggested neighborhood centers, and the commission did not take any formal action on the General Plan. One of the most interesting aspects of the neighborhood center discussion was the inclusion of Pacific Avenue for possible infill development. Ebbs mentioned the significant infill-potential around Sherwood and Weberstown Malls given that their parking lots sit mostly empty for the majority of the year. Ebbs hinted that these property owners may one day be interested in building on these areas, but just need some direction from the city. This is a term called “Gray Field Development” and it would be rather exciting to see this take hold in Stockton. Given the high attendance at this meeting, it’s clear that more people are starting to pay close attention to what’s happening in Stockton. As the debate about our future footprint continues, we can only hope that more people participate in order to ensure that the final General Plan is truly reflective of the wants and needs of all Stocktonians.